Product promotions have risen to a new level with the pending launch of the new video streaming and Internet enabled glasses from Google. According to the company, a limited number of customers will be selected to later purchase the $2500 glasses (for a discounted price of $1,500) when they Tweet about how they would use them or make a post to their Google+ account. A NY Times blog piece describes it here. Every time a person loses something its never good, especially when its expensive. I would think Google should set some kind of insurance for this, even though its just a glasses but a $2,500 glasses. And I agree Apple will be thinking of a similar idea or they could come up with some new, not just a glasses. They could probably make anything like a computer now! I will be holding out for Apples version as well! They would be painfully sad to lose, but think of this, how many times have we misplaced something and for the life of us couldn’t find it. Well, if we were recording with these glasses then we could just rewind and find our lost items, genius Google! The first time I saw Google Glasses was on the DVF fashion show – NY Fashion Week on Youtube. Diane von Furstenberg, the company’s founder and also the core designer, wore Google Glasses to film the whole video during the fashion show. See what happens when fashion and technology come together like people have never seen before, this is my first impression to Google Glasses. Google is very smart, they connect the new high technology product connect to fashion industry market, because they know NY Fashion Week is like a fashion guider and pioneer. All the stylists, the models and celebrities’s movements towards fashion and technology can influence people. Indeed, the almost 2 millions views can convince Google has made successful promote Google Glasses on internet. I think these things are very cool, and I would probably even own a pair when the pricing novelty wears off as well, but a later generation when the bugs are worked out :). I enjoy new gadgets and new technology immensely, but I also wonder what is too much? Will this be one of those things like the silly bluetooth headsets people wear all day just incase they get a call or for what ever other reason? If so, then your whole life intertwined with the glasses. Does it really make sense to be that “connected” or does it become intrusive. And knowing Google’s past with privacy concerns, I am sure this will raise an entire new batch. Kenny: I think you raise a very good point about their past with privacy concerns. Its alarming to think of what companies could do with amount of personal information. That being said, I am intrigued by Google Glass. To me it still seems like something out of a science fiction movie (Geordi La Forge from Star Trek, anyone?). I will anxiously wait to see if it will make it to the masses. I like the idea of the glasses but wouldn’t even consider spending that much money on them! Glasses are something most people lose very easily – I could probably count 20 pairs in the lost and found at work. Yes, most people would take care of $25000 glasses but I could see them flying off my face while riding my bike. I also feel like these would make me a walking target to be mugged 🙂 And like Kenny said, the first generation will have bugs and I’d rather wait till they’ve “nailed it”. I’d also rather wait till they aren’t such a big deal and the price is significantly smaller. I think the way Google has gone about making getting a pair into a competition. The fact that they use social media makes the hype even bigger. We’re basically doing the advertising for them. While I would love to be the early adopter of these glasses that take technology to a whole new level, and I have seen the glasses in action through youtube videos, I can’t even afford to pay the discounted price! But one can dream! If I had these glassses I would probably do something boring like take pictures with friends at a bar or take a video of me graduating on June 16th but I love the idea of capturing EVERY momenth so they really appeal to me. I could really see myself wearing them 24/7, especially if they come out with some options for frame shape, size, and colors. If customization comes into play I might not be able to resist! I agree with you, Oksana. While I would love to be an innovator or early adopter, I simply cannot afford it, and my life is not that interesting, so I would probably record something boring. I also think the frames are kind of ugly so I would wait until they become customized into different frame shapes, sizes, and colors. All in all, these Google glasses are really cool, and it is very interesting to see where technology goes. No wonder why Google’s stock price is over $800 a share! This is really cool I never thought Google is the company stepping into the market technology product industry. I would think Microsoft or Apple would come up with a product like this. Even thought I think this product is very cool, I would not buy it because one, its too expensive, second I do not like to where glasses at all, and third, I don’t care much about technology. I like simple things. However, I know many people who would love to buy the Google glasses. I just can’t stop picturing everyone wearing this, and looking like robots or something. I also wonder if there is going to be any privacy issues, what if they upload a video and made public, when others do not want to be on camera? I guess that is already happening now but with the Google Glasses, more things people do and see are going to be on the internet. This product should also have something to reinforce or secure the glasses onto your head so it won’t fall off easily or if someone was trying to yank it off, the glasses will still be secured. Overall, I can’t wait for this product to be more available and start seeing peoples videos! I agree with you, Shauba. Even though Google Glass is a very cool high technology product, it is not used for everyone. Just from the price point, the product targets market in high income/social class consumer segment; or people who really follow high tech-products. However, I actually think it will be a good idea to expand the market segment among YouTubers, especially in some famous YouTube celebrities since some of them like to recording Vlog, which is like Videos+Blog, showing their daily lives and post on YouTube everyday. Their Vlogs ware watched by subscribers and fans. If Google glass could help them to record their lives and post on Youtube without carrying their cameras everywhere. I think some of these people would be the potential consumers to Google Glass. Its fascinating to know that google is now taking a step forward in the electronics industry to introduce a device that commands action the consumer wishes. The other day I was watching a preview of these glasses, I cant remember what channel it was on, however I find it pretty useful for the our generation. I think the older generation would have a hard time adapting to such technology, unless the person is tech savvy. This would create a huge market share in the computer industry, and with apple as a major competitor, this may create more of a competition. If google makes this move and introduces this product in the market, I am sure that apple would attempt to create a similar product to gain consumers within the market, and selected target market. However since this is a very new and bold product, I would not be surprised if there are manufacturing defects, because it appears to be a major risk as well. I think that it is amazing to see how far technology can go. I think that these glasses are going to be a massive step in the virtual communication. I think that Google’ initiative to make only some selected person using it is very smart. It will create excitement around the product. First of all during the selection of the person, and then when they will post about it. Linking the social media with the launch is clever. But we still have to consider the price. This is not a mass communication interaction because all the fans will not be able to get them because it will be a very high ended product. Nonetheless I will love to have some of those when the price will decrease. These glasses will be the future of how we connect with people. To be able to share live events with anyone, anytime and at any place in the world is revolutionary. This is the next step In social media. Google may be first on the scene but like always Apple will come out with a slightly better version, and I’ll be holding out for that! I read a lot about the google sunglasses and i’m not a technology guy but I loved the advertising of this glasses and I want to get one of those. also, i have been asked to ship more than 10 google glasses to saudi arabia for friends, some of them willing to pay double of the amount to get it faster. so that will be a good business for me. I think this idea is great! We as consumers always desire the next innovative technology to bring us ahead of the crowd. Although these glasses seem a little pricey, there is no doubt that there is a line of willing customers to sport the new look. To offer the new technology to a specified group of customers is also a good PR move. There is no thing stronger to a brand trying to achieve/maintain an elite image than halo products. A halo product, only available to a select group of people, will create an invaluable word of mouth publicity. Potential consumers will see the product up close, and social media will further carry the message of value. Social media sites have a more meaningful content to some consumers as the critiques of new products are not paid and have a perceptibly more honest judgement. Google, you are just so cute! you really make my teeth hurt with all this stuff It is so sweet. are you telling me that you plan to bring these 2500 pair of glasses to market, and hit a mass market with these things? how much do they cost to manufacture? you think that people wont catch on you make them for a hundred bucks and sell em for 2500?? pa leease. if you think you can actually sell this product at this price to a mass market, more power to you, your ubiquitous sales abilities cease to amaze me. you are using this as a publicity stunt to make yourselves appear better then all of your competitors. good job. celebrity endorsement never fails! good job good, you swayed a million on lookers today with your amazing little advertisement/press release. Have you heard the term “galsshole”, it describe those people that is highly into the google glass and put way too much afford on it. For example, somebody walk into the men’s bathroom and having his google glass on, or having the recoding video on and without asking other’s permission, or starring into the prism for long periods of time you’re probably looking pretty weird to the people around you. I don’t think I would be able to wear Google glass, maybe just outside. I would constantly be having to think about the the things that are in front of me and whether or not I want what I was looking at to be recorded. For example if I were to be making a credit card purchase wearing the glasses my card number and my pin number and the 3 numbers on the back could be recorded. I believe these things can be hacked somehow, and I just wouldn’t be comfortable unless I was on foot in the wilderness or something. Back in 2013, Google showcased their launch of Google Glass. Since their launch, Apple’s marketing masterminds have followed in their footsteps, through their recent purchase of a 12-page ad spread in this spring’s edition of Vogue magazine. Just as Google launched their Google Glass product using a 12-page spread, Apple used the same technique to launch the Apple watch. Vogue is known for its highly expensive ad space; a single-page ad alone is roughly $189,888 based on the company’s rate cards. In light of this expense, Apple marketers are confident that the product will reach its target within Vogue’s spring edition. For instance, this 12-page ad spread will introduce the three models of their new line; the stainless-steel standard model, the sport version, and the luxury 18-karat gold edition. The Apple watch has already been modeled by Victoria’s Secret models and is marketing itself as being a fashion accessory as Google Glass did, rather than being nerd chic, which is what it is traditionally known for (Apple Watch Gets). I personally am eager to see Apple’s marketing in action once again, and am curious to see if this advertising spread within Vogue will increase the success of their new product, or if it will be a failed “success”, similar to the Google Glasses launch in Vogue, back in 2013. 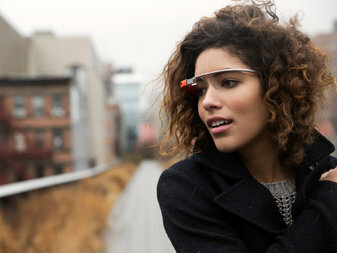 Boom, lady wearing google glass gets threatened at a bar. And with that being said, as a proud millennial, our generation needs to reevaluate our purchases in technology and remember that their are still people out there with nothing to lose who will punch you in the face for wearing google glass.